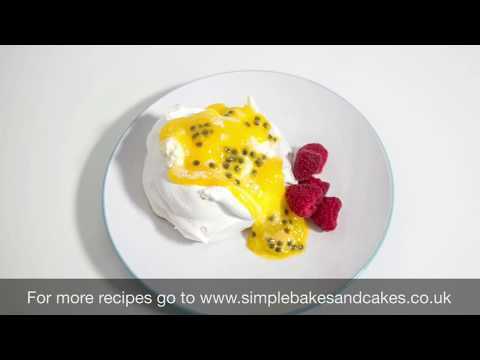 This passion fruit curd is a fantastically tangy and devilish addition to a meringue nest. It will give you a burst of fruity zing that compliments the sweet crunchy meringue, perfect for any occasion and really easy to make. The secret is to slowly cook the passion fruit curd over a low heat which can mean stirring it constantly for approximately ten minutes. If you cook it too quickly the egg yolks may curdle and leave you with a lump sauce. Sieve the contents of three passion fruits into a saucepan, leaving some of the juice and the pips for later decoration. Whisk thoroughly and constantly for about 5 minutes until mixture thickens. Do not be tempted to raise the heat if the process takes a little longer as this will probably result in your mix curdling. So, slow and easy, but keep whisking! Once thick enough, remove from the heat and leave to cool. Let me have your comments on this tasty treat and please share with your Social friends.